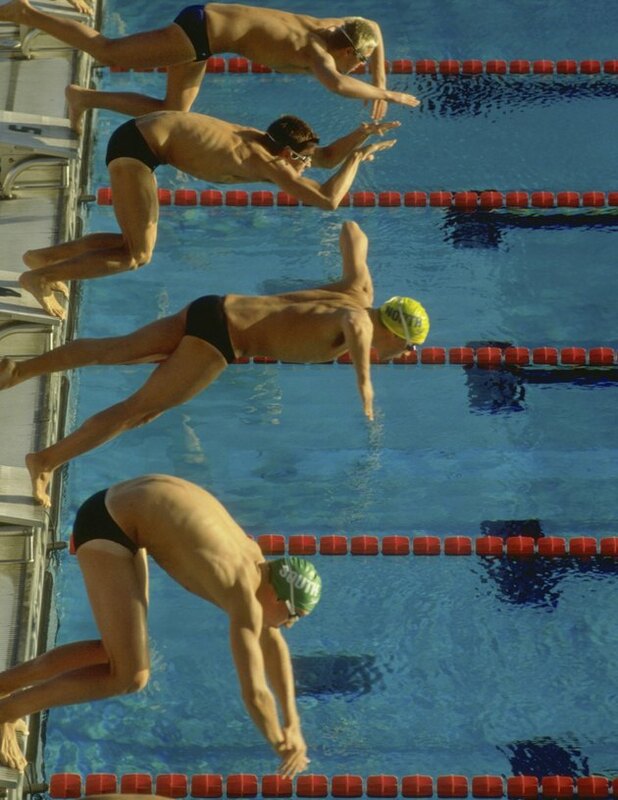 In competitions and other events, swimmers must be aware of their surroundings and keep track of their progress through the water. To help guide swimmers, many pools come equipped with specific markings. These marks help swimmers stay in their lanes and also let them know when they're reaching the end of the pool. Recognizing the marks and being able to see them clearly help swimmers efficiently navigate the pool. Many pools feature lines on the bottoms in the center of each swim lane. These lines act as guides to help athletes stay straight while swimming. The lines are painted a dark color, often black, to stand out. Near the end of the pool, the lines form a T-shape to alert the swimmer that he's nearing the end. In addition, pools often have similar dark lines with a T-shape on the end walls as well, further alerting swimmers that they are reaching the end of the pool. Lane ropes with attached floats also offer markers that swimmers can recognize in a swimming pool. Generally, different lanes have different color ropes, and these ropes extend the length of the pool. Floats are attached to the ropes at intervals. The color of the floats often changes as swimmers reach the end of the pool. For example, the floats at the 15- or 25-meter mark may be a distinct color from the floats in the center of the pool. This color coding helps swimmers recognize that they are nearing the pool's edge. The right pool lighting allows swimmers to see the various marks that guide them. Some swimming pools come equipped with underwater lighting, which illuminates the water and aids in visibility. Bright overhead lighting also helps swimmers see the marks in a pool. Often, the lights over the ends of a pool are brighter, helping swimmers see the pool's end marks. Goggles are an essential item for swimmers, as they help keep water out of swimmers eyes and enhance visibility in a pool. Without goggles, the marks at the bottom and sides of the pool would appear blurry and diffused, and the colored floats would be less visible. Swimmers use many different types of goggles depending on the type of swimming they are doing and their own personal preferences. Swim goggles may be clear, color-tinted or mirrored. Swimmers with vision problems also use prescription goggles to improve their eyesight while swimming.